IADC President and CEO Stephen Colville discussed safety and technical improvements in the offshore industry since the Macondo incident five years ago during a call on 9 April that also included Jack Gerard President and CEO, American Petroleum Institute (API) and Randall Luthi, President, National Ocean Industries Association (NOIA). Drilling today remains absolutely essential – hydrocarbon energy predominantly powers our world, enabling and sustaining all human wellbeing. It is inarguable that our lives would change massively for the worse without continued access to reliable and plentiful energy. But we recognize that we must continue to strive to drill ever more safely, cleanly and efficiently – for everyone’s sake. Macondo was a tragic incident, one which necessitated carefully considered and coordinated responses from our industry. Since then, an unprecedented level of collaboration to research and understand the failures that contributed to the incident has resulted in new technologies, operating systems and programs that address both equipment and safety culture. Development work on Automated kick detection systems, emergency containment and production infrastructure; improved pore pressure prediction during planning and sub-salt drilling; and improved well control and response modeling for reliability based well design have all been instituted since 2010. At IADC, there was a real recognition that since drilling involves our rigs, our people and our equipment, drilling contractors are responsible for ensuring their ability to drill safely, cleanly, efficiently and responsibly. Throughout IADC, our almost 1800 members share the belief that well control is the most critical area for successful operations. To that end all our members, across all areas of the industry, are working together through IADC on the creation of programs and solutions that address well control training, safety and performance. The best example of this is the creation of the Well Control Institute. The WCI is a unique industry Well Control oversight body, comprising representatives from across the industry, working to develop solutions to issues such as rig crew communication, personnel competence, human factors and situational awareness. In a similar vein, IADC has just launched WellSharp, a total root and branch revised well control training program, introducing training specifically targeted to every employee with well control responsibilities, whether office-based or rig-based. The training program is rigorous, with content for prevention, situational awareness, barriers and risk awareness and management. The IADC Deepwater Well Control Guidelines and Drilling Manual have been completely revised, with information representing the latest technologies, and are essential resources for rig personnel. 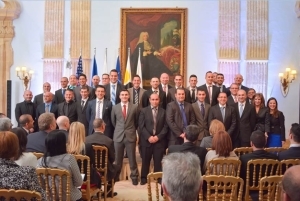 On 30 March, 24 graduates of the Ableman Drilling Careers Academy in Malta were presented with the industry’s first Workforce Attraction and Development Initiative (WADI) certificates. The pilot program represented a collaboration between Ablecare Oilfield Services Group, the parent company of the academy based in Malta, and Lone Star College System, based in Houston, Texas. The two worked together to develop and deliver the intensive seven-week course for entry-level oil and gas personnel. Graduates of the Ableman Drilling Careers Academy receive industry’s first WADI certificates on 30 March in Malta. By the end of this year the academy will have invested in a state-of-the-art drilling and well control simulator suite, equipped to train 12 candidates per course and an offshore crane operator training simulator. Lone Star College provided the curriculum and instructors for the academy’s course. For more information about the WADI program, please visit IADC’s Accreditation Website. Our industry did not wait for BSEE’s regulations to make major changes to our operations and procedures. In the last 5 years, we have worked collaboratively to understand the failures of the Macondo incident and as a result have developed and instituted major changes with regard to equipment, procedures and safety protocols to protect against another well control incident of this magnitude happening again. The Proposed Rule can be found on the Federal Register website. Elizabeth “Liz” Leoty Craddock recently joined IADC as Vice President, Policy, Government and Regulatory Affairs, leading the association’s Washington, D.C. office. Craddock most recently served as the first female Majority Staff Director of the U.S. Senate Energy and Natural Resources Committee under Chair Senator Mary Landrieu. In this role, she oversaw the passage of the BLM Permit Processing Improvement Act and over 80 public lands bills. Craddock joined Senator Landrieu’s office in 2006, serving as Legislative Director and Counsel, coordinating the Senator’s legislative affairs, developing legislation on behalf of the Senator, and providing vote recommendations. Liz was part of the Senator’s team that passed The Gulf of Mexico Energy Security Act (GOMESA), which opened 8.3 million acres in the Eastern Gulf of Mexico, as well as established revenue sharing for the Gulf energy producing states. Prior to serving in Senator Landrieu’s office, Craddock worked for U.S. Congresswoman Karen Thurman and Congressman Dale Kildee. She also spent time during law school working for the House Energy and Commerce Committee. Craddock received her B.A. in Political Science and B.S. in Public Relations from the University of Florida, and earned her J.D. from Tulane University Law School. She is a native of Delhi, Louisiana and a member of the District of Columbia bar. Liz Craddock can be reached via email at elizabeth.craddock@iadc.org. On 31 March, the US Coast Guard issued a Final Rule imposing new requirements for third-party certification of electrical equipment installed on hazardous areas on MODUs and other vessels and facilities operating on the US Outer Continental Shelf. The rule signals a new era of unilateralism by the US Coast Guard in its regulation of activities on the US OCS. The new requirements will apply to vessels and facilities constructed after 2 April 2018. “Constructed” means (a) the date the keel was laid or (b) construction identifiable with the vessel or facility began and assembly of that vessel or facility commenced comprising of 50 metric tons or at least 1 percent of the estimated mass of all structural material, whichever is less. The regulations require that covered equipment be tested and certified by an independent laboratory specifically accepted by the Coast Guard. At the urging of IADC and other segments of the industry, the Coast Guard considered simply accepting the provisions of the 2009 IMO MODU Code, but rejected this suggestion because the MODU Code “is not a legally binding instrument and by its terms does not apply to vessels that are not MODUs. Additionally, there are differing interpretations of the ‘‘independent testing laboratory’’ certification contained in the 2009 MODU Code. As the coastal state with jurisdiction, we find that it is a necessary and reasonable safety measure to require that newly constructed foreign vessels and floating facilities that engage in OCS activities have uniform safety standards for explosion protection in hazardous locations. Parts of industry also suggested that the Coast Guard consider accepting equipment with certification issued under the European Commission Directive (94/9/EC) on equipment and Protective Systems Intended for use in Potentially Explosive Atmospheres (ATEX). The Coast Guard also rejected this suggestion noting: “ATEX certification does not require independent third party testing for all types of equipment” and “the ATEX Directive is currently not applicable to seagoing vessels or MODUs and it is our experience with ATEX certification that it can be difficult to determine the extent of testing performed by the ‘‘notified body’’. The Coast Guard also rejected the suggestion that an electrical equipment register be created and maintained, acknowledging that this would be “critical to safety”, but stating that the suggestion was “outside the scope of this rulemaking. IADC members are urged to consider these new requirements in any new construction projects where the possibility of employment on the US OCS exists, as it may prove prohibitively expensive to retroactively prove compliance. The Final Rule, Electrical Equipment in Hazardous Locations, can be accessed at the Federal Register website. 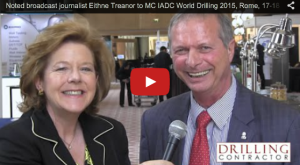 Noted industry broadcast journalist and professional moderator Eithne Treanor will serve as master of ceremonies for IADC World Drilling 2015, 17-18 June in Rome. Ms Treanor has moderated high-level conferences around the world. An experienced broadcast reporter with CNBC and other outlets, Ms Treanor has introduced leaders of state, senior government figures and business officials. She is an expert presenter on energy matters, having moderated international conferences for OPEC, the World Future Energy Summit, NOG and various industry events. She has also presented at high-level banking and finance forums and corporate governance conferences. Prior to World Drilling, Ms Treanor is moderating OPEC’s June meeting in Vienna. This year’s theme, “Leadership in Turbulent Times,” catches the mood of today’s industry leaders, buffeted by the sudden intensity of the current downturn. Mike Killalea, IADC Group Vice President/Publisher interviews Eithne Treanor. Keynote day 2: Anne Myhrvold, Director General, Petroleum Safety Authority Norway. Submissions will be accepted beginning 1 March through 21 May and will be judged based on the above criteria by a selected group of IADC staff and industry veterans. The winner will be contacted in August and the award will be presented by IADC Chairman Ed Jacob during the IADC Annual General Meeting on 5 November in San Antonio. 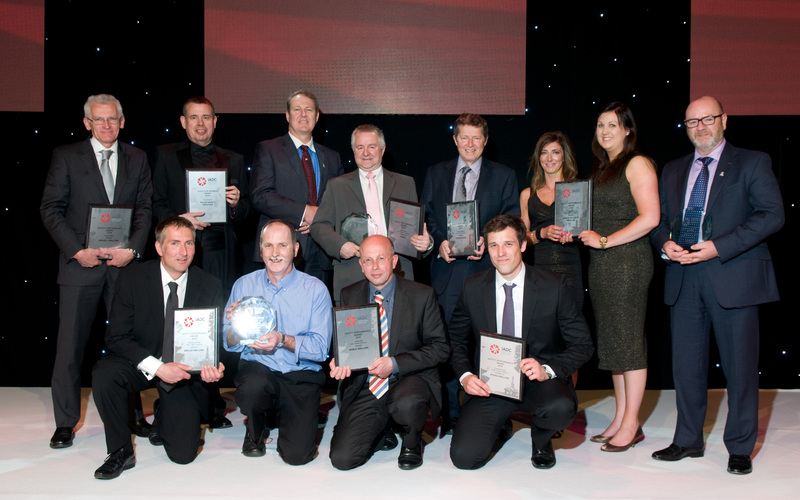 The IADC North Sea Chapter has once again recognized the very best in safety performance at its annual Safety Awards Ceremony held in Aberdeen on 24 April. Lee Reborse of Noble Drilling, North Sea Chapter Chairman welcomed a large turnout and guest speakers included Tom Burke, President and CEO, Rowan Companies and Jim House, Region Vice President and Managing Director, Apache North Sea. A number of awards were presented to companies and installations for their safety record over the last year. This year, awards for best safety performance in 2014 went to North Atlantic Drilling and Noble Drilling in the Jack-ups category; Awilco Drilling and Transocean in the Floating Rigs category and Odjfell Drilling in Platform drilling. Chairman’s Awards, which recognised individual rigs and their crews which had the best safety performance in 2014, went to Ensco 92, Ensco (Jack-up); WilHunter, Awilco Drilling (Floating Rig); and Murchison, KCA Deutag (Platform). The Associate Member Award was presented to Falck Safety Services. The event was hosted by journalist and broadcaster Sally Magnusson and funds raised on the evening will be donated to Alzheimer Scotland and Mental Health Aberdeen (MHA). West Group Industrial (Full), USA. SISEMHL Consultores S.A. (Conditional), Mexico. Weatherford Drlg Int’l (BVI) Ltd.: Rig 155 (15). Sidewinder Drilling Inc.: Rig 61 (1); Rig 62 (1); Rig 103 (1); Rig 122 (4). XI’AN LANDRILL OIL TOOLS CO., LTD, XI’AN, SHAANXI, CHINA.